Sources: Finavon Estate records & records from other South Esk fishings. Year Feb March April May Total COMMENTS from Cyril Butler’s notes 1895 to 2000. Tenant FCW for 50 years. Also other beats & whole river catches. 42 – – 6 12 18 Low effort. I think Terence Horsley was a tenant at FCW in 1941/42. 52 – 1 5 7 13 The first year of consolidated Scottish salmon & sea trout catches. 09 – – 8 13 21 Two big fish (well into the 20s of lbs) seen from Haughs Aqueduct. Low effort because of low water. 10 – – 12 1 13 May very low water. Potentially a good spring run, ruined by low water. Hence Low effort in the late spring. 11 – 8 7 18 33 Prolific spring salmon run. Effort up. Colin Gibb at Inshewan commented “the best spring run since the 1960s”. Usan nets did well too. Large numbers of fish, many diseased, seen in Sawmill Dam Pool in late April. It is important to appreciate that fishing effort varied enormously during these 111 years. There are clues occasionally which have enabled me to assess effort. For example, between 1935 and 1940 there was a local syndicate during the sea trout season. I have spoken to the families of some of those Forfar shop owners and traders, from which it became clear that members of that syndicate were regulars and their skill level was high. The catches reflect that. On the other hand, particularly in the early years of the twentieth century, effort was desultory and sometimes non existent. I suspect that, during the years when the spring catch dominated the returns, noone really bothered to fish after about mid June, and sea trout were simply not valued. One of the jobs on my ‘to do’ list is to try to devise a method of measuring effort, somehow incorporating skill and local knowledge as important factors in measuring the effectiveness of the effort made. For example, if it is Derek Strachan or Moray Macfarlane fishing for spring salmon in late March they will know where these early running fish are likely to be in the cold strong flows of emerging spring. 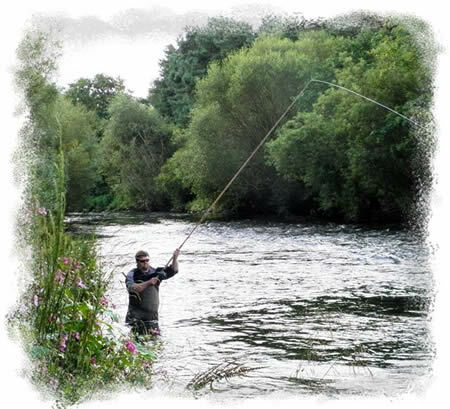 That knowledge means that one hour spent on the river by an experienced local rod probably is the equivalent of 2 or 3 hours of someone new to the river. Finavon Castle Water. Putting the 2011 season in context. Anyone talking about salmon these days simply has to take account of their unprecedented collapse in survival at sea before they start counting what they have caught in their wee patch. The truth is, and I cannot escape saying it, is that there are not enough salmon returning to our rivers to justify continuing to kill them as we did in the past. With that in mind anything that follows in these blogs about the performance of 2.4 miles of the middle South Esk during 2011 must be seen in the context of the overall decline in numbers of fish. A March salmon of 15lbs (below) from the Willows on Milton Beat. Spring fish like this one are the ultimate quarry of the salmon fly fisherman. In these out-of-season blogs I have attempted to show the local constraints to good numbers of salmon (and sea trout) accessing the river. The unpalatable fact is that the river is probably producing as many smolts as it did thirty years ago. There was far more exploitation by the nets then, and many more obstacles in the river. Finavon’s catches should therefore be seen as rods exploiting the remnants of far greater numbers of fish. The fact is that we are all catching fish from a diminishing stock of survivors, as are the coastal nets. 95% of our smolts are destined to die at sea. 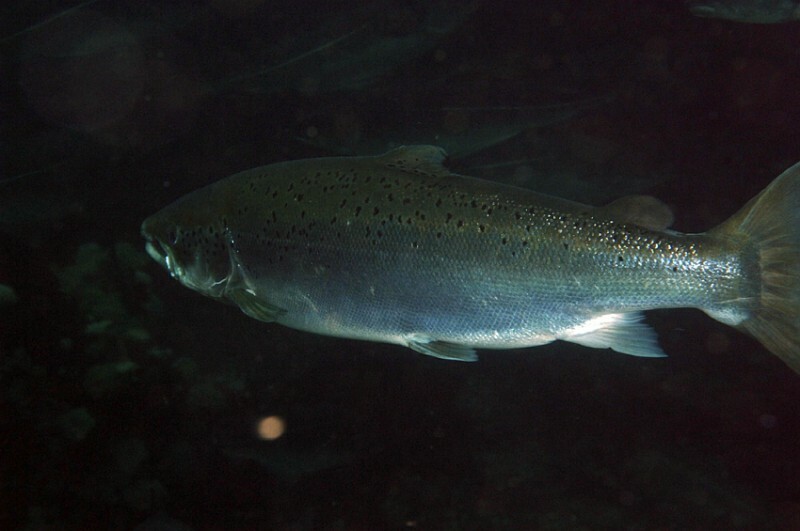 Multi sea winter salmon that feed in the Irminger Sea or off the Greenland coast are doing quite well, but those thin grilse – Belsen grilse – are scraping by on a meagre diet offered by their traditional feeding grounds in the northeast Atlantic Ocean. We can hope for change, but we shouldn’t bank on it. In the meantime we all need to be contributing to the maximum possible output of naturally generated smolts from our little river, because at the end of the day our river is a smolt factory! In 2011 the number of fish entering the river between the 16th of February and the 31st of May was probably on a par with runs of fish in the 1960s and 1970s. A single year cannot of course tell the whole story, but what it does tell us is that in the late autumn of 2006 eggs were laid, probably by MSW fish. These spawning fish would have had a propensity to produce fish with a preference to return to the South Esk as multi sea winter spring fish. Moreover, they would have had to return in sufficient numbers to ensure recruitment of good numbers of juveniles, probably somewhere in the upper South Esk catchment. Over the two years following spawning the progeny of those fish grew to the point where in the spring of 2009 they left the river as S2 smolts and headed out to sea. After two winters at sea they returned to the South Esk in the early months of 2011. At least something is right! For all the above to happen, quite a lot of things have to be right. If we assume that the survival rate of two sea winter fish from smolt to their return is about 5%, (but it could be better than that) then these survivors, from the abundance observed in the spring of 2011, indicate that a good number of S2 smolts left the South Esk in May/June 2008. That suggests that the habitat in certain (currently unknown) parts of the South Esk system is capable of meeting the requirements to produce healthy smolts with the potential of becoming spring salmon. Do spring salmon beget spring salmon? Well, maybe! An interesting additional point is that, for there to have been sufficient spawners in 2006 to produce a good output of smolts in 2009, the spring run of 2001 MSW spring salmon (in which 10 were caught at Finavon) must have had sufficient successful spawners too. While we shouldn’t assume that a spring run spawner’s progeny is necessarily comprised of only spring fish, evidence points us towards that assumption. So, although we should not make general comments on the condition of stocks and the habitats that support them from one year’s return, it is clear that some cautious extrapolation can be done. What can be said with confidence is that the South Esk continues to have the characteristics (e.g. water chemistry, temperature and gradients) required by spring salmon. But what precisely are those characteristics, and where in the catchment are they? Kinnaird dyke on 14th December 1969 (below) with the River at 3″ at Finavon. A much narrower and steeper access with no ‘pool’ at the base of the pass made it very difficult for fish to use in high or cold water. 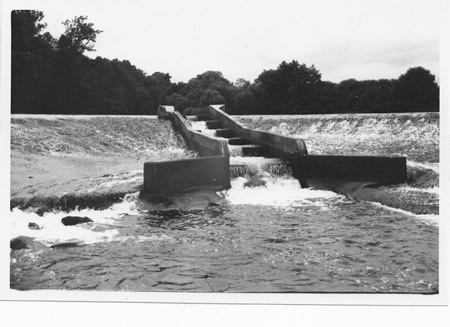 Donald Macintyre, the water bailiff, remarked that the rough concrete face of the dam damaged fish and made them prone to infection. 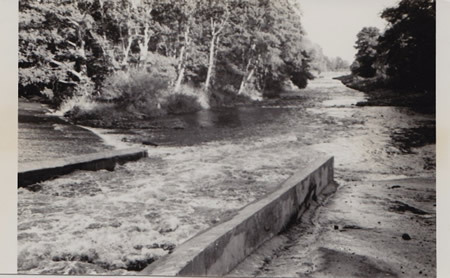 Kinnaird Dyke (below) on 29 September 1970 with the River at 1′ 4″ at Finavon. The repairs to the dyke that were done during 1970 made a big difference to enabling salmon to access the river above Brechin in the spring months. But it wasn’t until Colin Carnie in the mid nineties redesigned the dyke to reduce the flow through the pass with two wooden baffles which to this day enable salmon to swim through the pass early in the year. 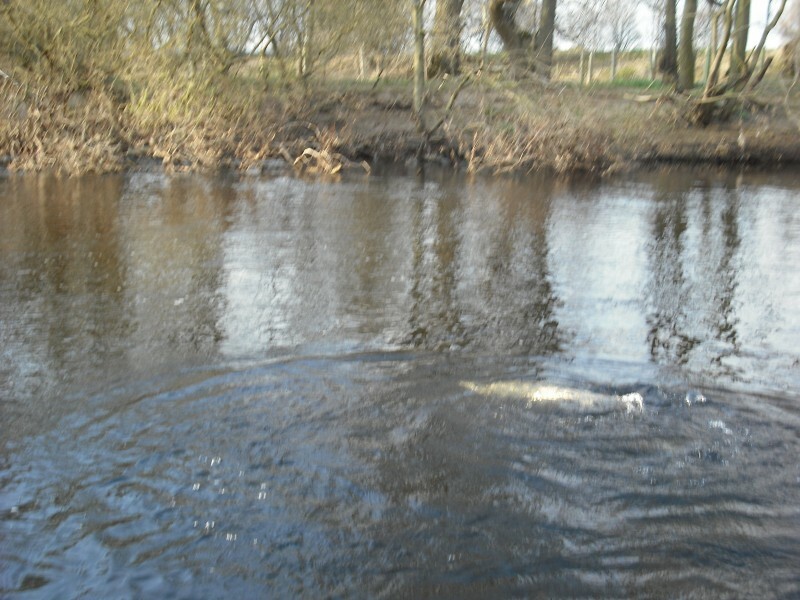 This is why we now see spring salmon at Finavon regularly in March month. Spring 2011 salmon numbers: an educated guess? 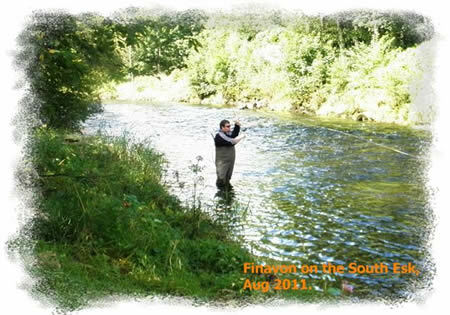 A calculation, based on the South Esk spring run of 2011 having a pre fishery abundance (PFA) of about 2,000 MSW salmon, representing 5% or more of the smolts that left the river, indicates that in 2009 the river produced up to 40,000 smolts with a preference to return as spring salmon. You may ask how I got the PFA figure of 2,000 spring fish. I can only answer that by claiming the number as a guess based on the declared Usan net catch, rod catches, the number of dead & diseased fish, and observation of fish in the pools in March, April and May. I note that no-one has yet challenged this estimated number of spring salmon. It was clear to those who caught and released 2011 spring salmon that these survivors were in excellent condition & had fed well during their time at sea, suggesting that their marine feeding destination was probably in the productive western half of the ocean. It also begs the question, in the context of the poor grilse numbers in 2011, whether we might reasonably predict good returns of well fed MSW salmon in 2012, from grilse that elected to stay on for their second winter at sea and head west to feed. I suspect that may be a bridge too far in scientific terms, but a reasonable punt for an amateur such as myself! What it doesn’t explain is why, after a good grilse run in 2010, we had such a strong run of MSW salmon in the spring and summer of 2011. These are questions that scientists are now addressing, following the success in sampling salmon at sea done by the SALSEA project. But what happened to the other c.95% of fish that didn’t survive? At what stage in their sea journey did they die, and from what cause? So, while a snapshot can only be an indicator, and I certainly wouldn’t claim that it tells the whole story, a single year’s return as we had in 2011 does tell us something about the River’s ability to generate healthy populations of S2 smolts. Wouldn’t it be interesting to learn which parts of the South Esk catchment have this ability? That is why I like the Marine Scotland Science plan to track the destination of 150 spring salmon. It would be so good to learn which bits are productive, and why they are, wouldn’t it? And, just think, if we could find out where the juveniles grow well, wouldn’t we then become much more precise in our habitat improvement work? Posted in History, River Report, Salmon | Comments Off on Finavon Castle Water. Putting the 2011 season in context. So balmy has the weather been that anyone standing on the bank of Boat Pool at Finavon in the last few days could be forgiven for thinking that the winter is still some way off. With temperatures of up to 15C and water temperatures in the 6C to 9C range I expected to see running fish, and this is precisely what I did see. Mainly grilse but a few bigger fish were powering through FCW pools in really good water levels. The river is clean, the flows generous and there is nothing whatsoever to prevent salmon reaching their spawning locations. This is the hut at the head of Indies Pool which is in the top three of FCW pools. In the past Indies was a 100 sea trout a year pool, but in recent years has struggled to get past 30. 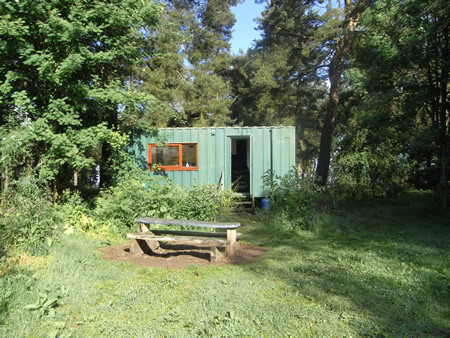 The hut is located in Indies Wood and provides warmth, shelter and a place to snooze for night sea trout fishermen and daytime salmon anglers. Just the place for late night crack and a dram! Seeing running fish in mid November, some of them silver, invites the question about what proportion of the annual run of salmon and grilse enter the river after the 31st of October. My guess is quite a high proportion; maybe as much as 20%. But that is only a guess: we need to find out where they go, how many of them there are and whether they belong to a distinct genetic group. Is it run timing that distinguishes their population(s) or is it their genetically ‘hard wired’ tendency to return to a particular location or tributary? Questions, questions, but precious few answers!